Fonthill is an affluent community in the town of Pelham, Ontario, Canada. It has a few small industries, but is primarily a residential suburb known for its fruit orchards, nature trails, and community spirit. As a bedroom community, most residents commute to Welland, St. Catharine’s and some as far as Buffalo, Hamilton and Toronto daily for work. Letters written by Henry Giles, a settler who came to the area in 1840, suggest that he chose the name Fonthill because the area looked similar to the area around Fonthill Abbey in England. The village's first post office (and thus the Village of Fonthill) was established in 1856. On June 10, 2006, Fonthill celebrated its 150th anniversary. The celebration was marked by the opening of the band stand (a replica of the original band stand the existed in the early 1900s), historical displays and a variety of musical and artistic presentations. Following the War of 1812 it was proposed to build a fortification on the site, to be named Fort Wellington. As tension between Canada and the U.S.A. lessened, the idea was abandoned. On a clear day, the tall buildings of Niagara Falls to the East and Toronto to the North are clearly visible from a particular vantage point that also allows views of Lake Ontario, Lake Erie, and the skylines of both Toronto and Buffalo. At one time a ski tow operated on the slope. Fonthill is also the birthplace of 'Tennis Ball Golf', invented by Eric Sinclair and Jason Giallonardo of Townsend Circle in southern Fonthill. Fonthill is a fifteen-minute drive south of St. Catharine’s, five minutes northwest of Welland, twenty minutes west from Niagara Falls and twenty minutes north of Port Colborne. Its main access route is Highway 20, a portion of which is also known as Canboro Road, running west to east from Hamilton to Niagara Falls. Access to the United States is through either the Peace Bridge in Fort Erie, the Rainbow Bridge in Niagara Falls, or the Lewiston-Queenston Bridge in Queenston. 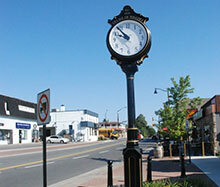 In the Town of Pelham, Fonthill is the commercial centre where residents have access to basic shopping necessities. It also has the Town of Pelham Municipal offices. Several retirement homes are located in Fonthill. Plenty of greenspace areas are located within the community. A series of public access trails, the primary system being the Steve Bauer trails which are named after a Pelham Olympian, are built into the residential planning of Fonthill. Harold Black Park, named for a former Mayor, plays host to the town's Canada Day festivities, which includes a parade down Haist Street. There is also a park named in honour of local golf legend Marlene Stewart Streit, which consists of a baseball diamond, a large outdoor pool, and nature trails. Fonthill has tried to balance its natural resources with a suitable development scheme, keeping an eye on a policy of smart growth. Economic activities in the area are diverse. Orchards of cherry, apple, and peach trees surround the town. There are thousands of hectares of vineyards and a viable greenhouse industry. Additionally, thousands of tons of aggregate material are removed each year from a large quarry at the top of the Fonthill Kame. Quarry sites in the area are usually rehabilitated. Fruit orchards have been developed in many of these sites, and the Peninsula Lakes Golf Club, designed by Rene Muylaert, occupies one. St. Alexander Catholic Elementary School (operated by the NCDSB) opened in 1958. In 2011, it had an enrollment of about 450 pupils. No. 613 Royal Canadian Army Cadet Corps is based at the local Royal Canadian Legion hall. It is affiliated with the Lincoln and Welland Regiment. Fonthill Montessori Preschool takes children from 18 months to six years old. This is a private school.